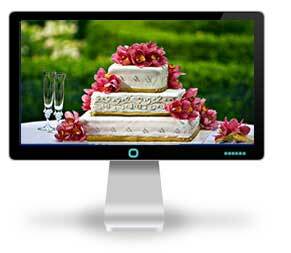 "The bride has generally two bridesmaids, and the bridegroom the same number of groomsmen. 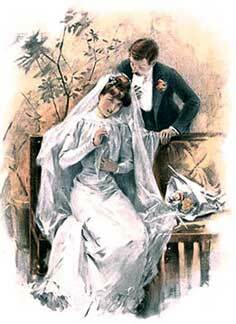 The bridegroom takes care to provide the wedding ring, and have it in readiness at the proper moment. When the ceremony is over, the question sometimes arises whether the bride is to be kissed by the bridegroom .... the practice is decidedly to be avoided; it is never followed by people in the best society." TRADITIONAL WEDDING LOCATION: The ceremony of marriage is ordinarily governed by the ecclesiastical formularies of the sect to which the bride may belong, who chooses the clergyman for the wedding ceremony. TRADITIONAL WEDDING PROCESSION: The bride has generally two bridesmaids, and the bridegroom the same number of groomsmen, but they may be both increased. 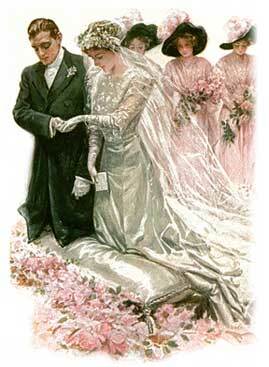 The marriage is ordinarily performed at 12 o'clock in the day, at the church, which is first entered by the bride resting on the arm of her father, uncle, or whomsoever is to "give her away." Next comes the bridegroom, with the mother or nearest matronly female relative. Then follow the groomsmen and bridesmaids, arm in arm. The immediate relatives complete the procession to the altar, where the bride and bridegroom take their places in advance, with the parents a little behind, and the rest gathered in a group about them. TRADITIONAL WEDDING RINGS: The bridegroom takes care to provide the wedding ring, and have it in readiness at the proper moment when called upon to put it on. He then places it on the third finger from, but not counting the thumb of the left hand. TRADITIONAL WEDDING KISS: When the ceremony is over, the question sometimes arises whether the bride is to be kissed by the bridegroom. We should leave its decision to the instinct of affection were we not solemnly warned by a portentous authority on deportment that "the practice is decidedly to be avoided; it is never followed by people in the best society. A bridegroom with any tact will take care that this is known to his wife, since any disappointment of expectations would be a breach of good breeding. 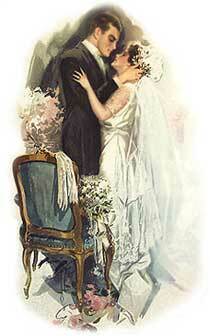 The bride is congratulated by all her friends in the church, and elderly relatives will kiss her in congratulation." This is, of course, now settled beyond all peradventure of doubt by the fact that, according to the same authority, "Queen Victoria was kissed by the Duke of Sussex, but not by Prince Albert."